My husband, baby and I spent the last ten days travelling from our home in southern Ontario to sunny North and South Carolina on a trip that was half vacation, half our friend’s wedding. We didn’t get the best weather, but it was warmer than the ice storm we left behind! Living relatively close to the US/Canada border means a lot of my friends and colleagues go shopping for clothes and food “over the river”. They always return with tales of the food novelties you can find there – Goldfish crackers in 8,000 flavours (and colours). Doritos that burn your tongue off. Parmesan bricks for half the price of our cheese. And so on. While my co-workers would arrive at work after a shopping trip showing off their single-serve snacks and granola bars incorporating the latest “superfood” (chia, anyone?) I always held back my cringes. On one hand, the sheer number and variety of foods available is a marvel of modern food science. You can take corn and make it taste like anything! But on the other hand, it’s kind of creepy that corn tastes like everything but…corn. For this rare road trip, I was excited to check out for myself some of the oddities in the museums that are American grocery stores. Unfortunately, having baby Popcorn with me meant I was relegated to nap-monitor duty more than grocery shopping duty, and I didn’t get to do as much gawking as I wanted to. However, I do feel like an honourary American after shopping not once but twice in a Wal-Mart supercentre (man those things are huge!). Because we drove down, we also stayed at several different hotels; most of which offered a “continental” breakfast. 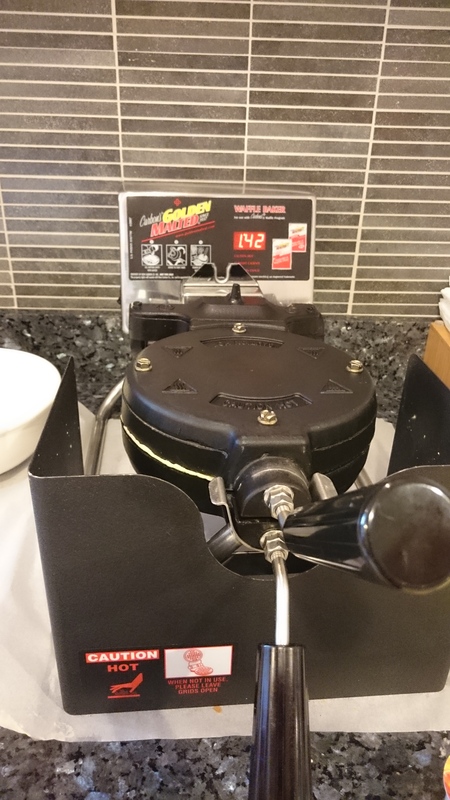 The majority of these unstaffed breakfast bars had a waffle maker – something you don’t see in Canada. 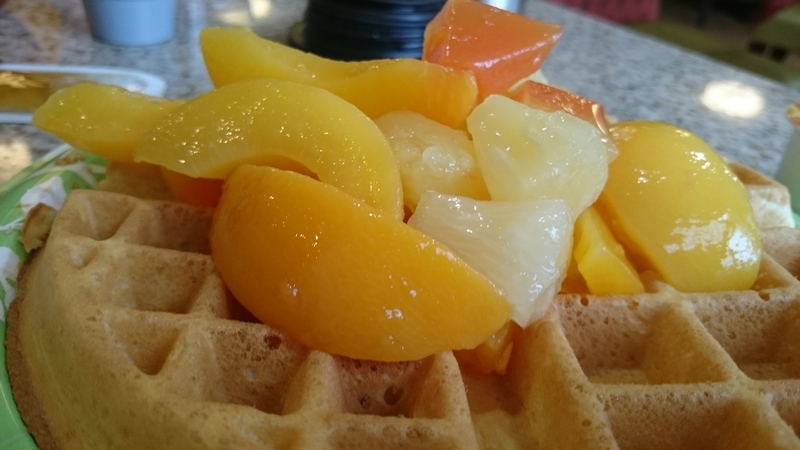 Waffles are not my favourite breakfast item, and of course they’re made with white flour. But I did sample a few to better understand the appeal (I think it’s just an excuse to eat syrup in the morning). On the plus side, pecans are a local crop and they were inexpensive…so at least my waffles had some protein in them. Rubbery hardboiled eggs and a banana were the only unprocessed items available. Anyway, eating some of these items reinforced to me how eating real food is so much more satisfying than processed food – both physically (my stomach felt empty after eating the processed food) and mentally (there is no joy in reduced-fat yogurt). Ingredients: Corn syrup, high fructose corn syrup, water, salt, caramel color, natural and artifical flavors. 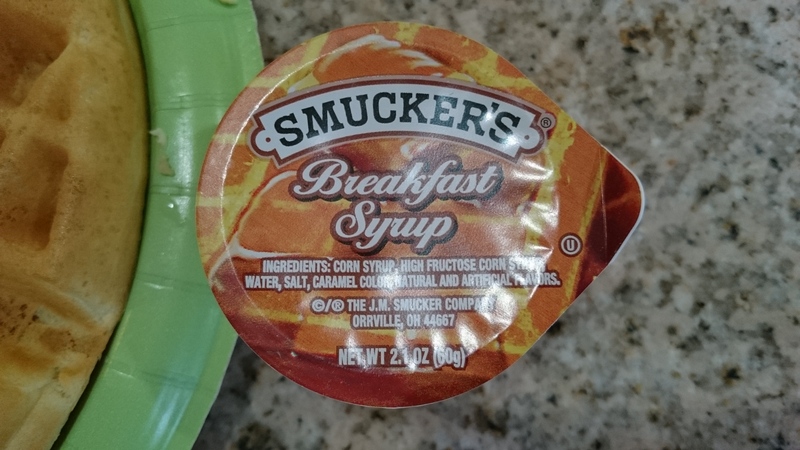 I wouldn’t expect real maple syrup in a continental breakfast or waffle house, but this mixture of corn syrups and fake colours/flavours was a bit more artificial than I was prepared for. Caramel colour is a big no-no. I tried it, and it tasted fine. But sugar syrup always tastes good, right? 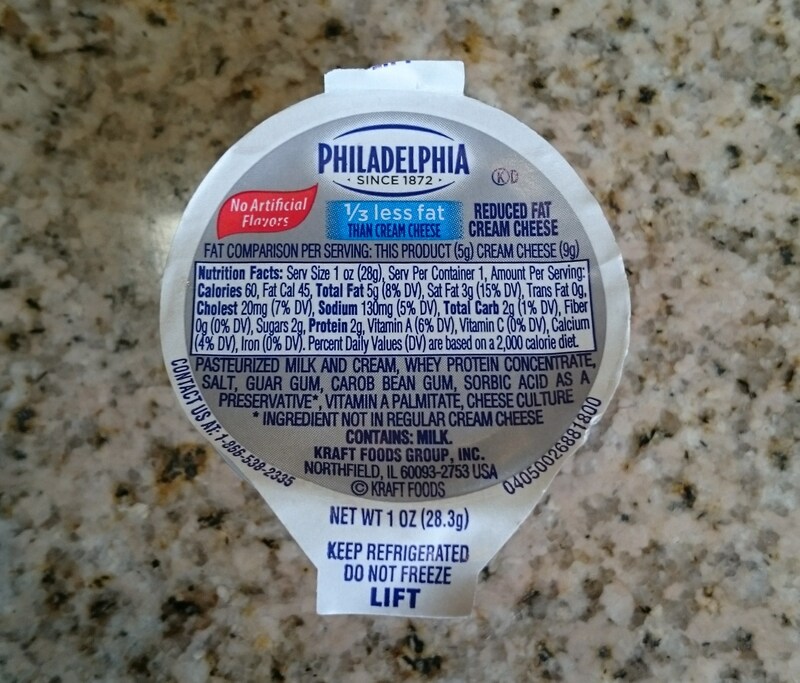 This cream cheese tasted pretty much like what you get here, but was thinner in consistency. Give me real cheese instead anyday. Ingredients: Water, liquid and partially hydrogenated soybean oil, salt, hydrogenated soybean oil, vegetable mono & dyglycerides, pectin & sodium alginate, potassium sorbate (a preservative), natural & artificial flavors, citric acid, calcium disodium EDTA added to protect flavor, beta carotene (color), vitamin A palmitate added, whey. Fourteen ingredients make a solid chemical cocktail more terrifying than Frankenstein’s monster. This was the one product I refused to sample. Margarine is scary enough but this partially hydrogenated monstrosity takes it to a whole other level. I know real butter is expensive, but that’s becuase it’s real food (and it comes from real animals). Butter has one ingredient: cream. 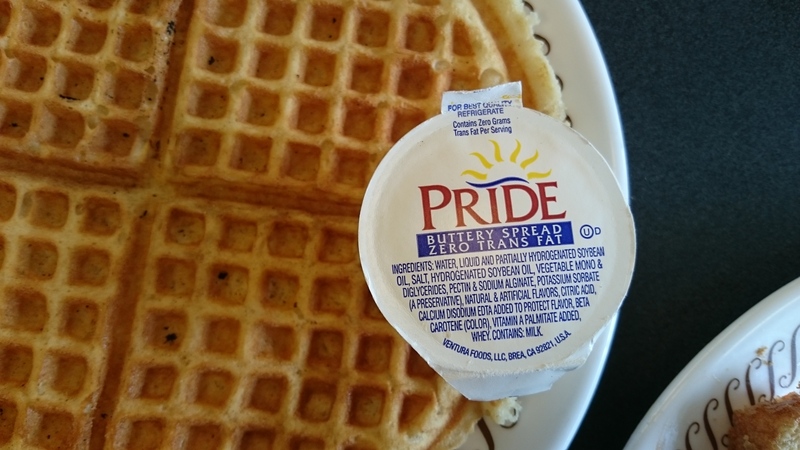 And I’d rather eat my waffle plain than let a morsel of this stuff pass through my lips. I don’t want you to get the impression our trip was full of regretful meals. We sourced a few local brewpubs that brew unique beers and serve quality food. I sampled some amazing dishes like grits with a mushroom cream sauce and a house-made veggie burger full of beans and whole grain rice. 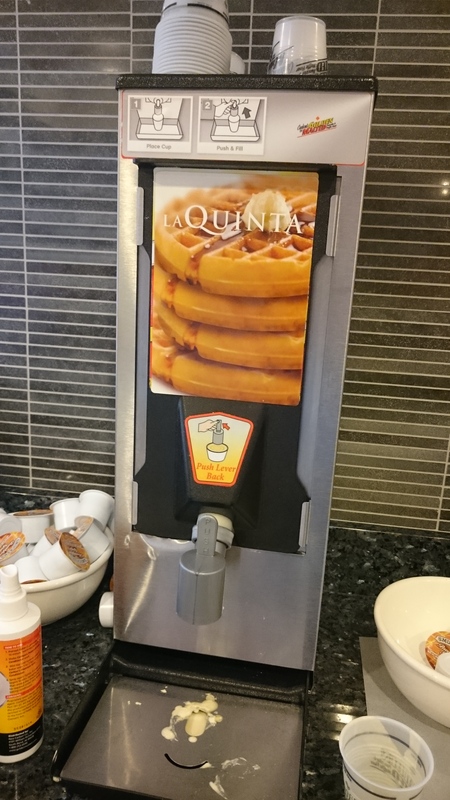 Next time, I’d also source hotels that provide a hot breakfast instead of one that comes in single-serve packets.